San Francisco Public Golf Alliance : UPDATE: The 2018 Online Silent Auction Concluded. Congratulations to the winning bidders. UPDATE: The 2018 Online Silent Auction Concluded. Congratulations to the winning bidders. ...On-line bidding for the silent auction is open now! UPDATE: On-Line bidding for the silent auction closed at 10pm PDT Tuesday May 22 and continued in-person at the tournament at Sharp Park on May 26. Congratulatons to the winning bidders! Great courses, Scottish Highlands golfing adventures, and great values are among the fantastic items you'll find in this year's auction. Bid on: Three days of all the golf you and your foursome can play plus two nights lodging at America’s No. 1 golf resort – Bandon Dunes; A foursome at the ultra-private Friar’s Head Golf Links on Long Island – ranked #19 in the newest Golf Digest list of America’s greatest course; A one-month international membership with unlimited golf plus guest privileges at Murcar Links in the high dunes by the North Sea adjacent to Royal Aberdeen in Aberdeenshire, Scotland. And then there are foursomes at Royal Dornoch, Spyglass Hill, Pasatiempo, Poppy Hills, Pacific Grove, Claremont, Stanford, Berkeley Country Club, Silverado, Lake Merced, Green Hills Country Club, Callippe Preserve, Poppy Ridge, Wente Vineyards, Presidio, Bodega Harbour, Foxtail, Crystal Springs, Metropolitan, and you name it. The auction is now open for online bidding and will close on Tuesday, May 22, 10pm PDT. 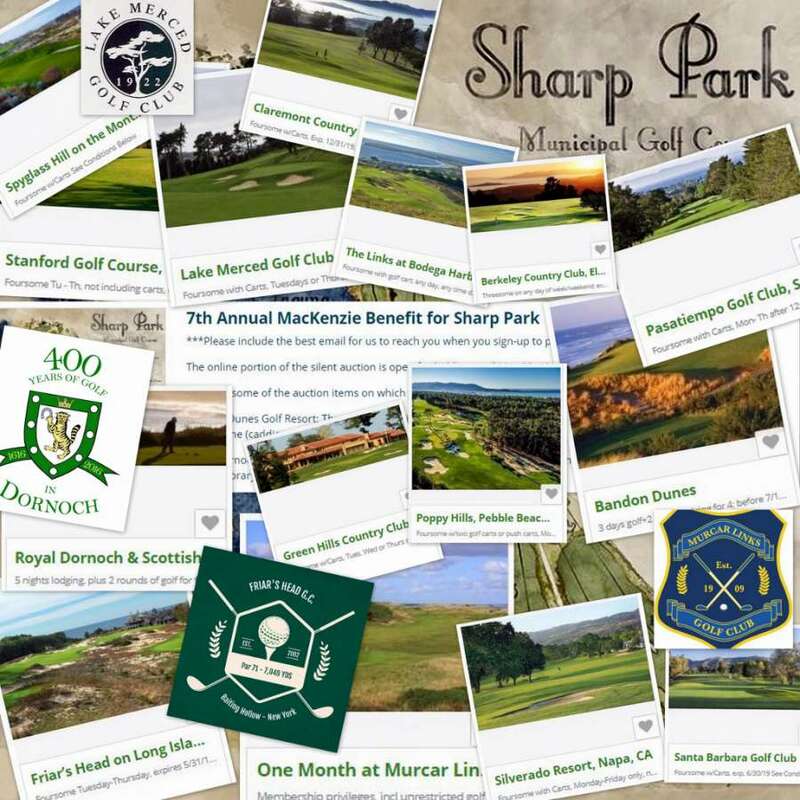 The auction will then continue in-person only on May 26 at Sharp Park, at the Seventh Annual Alister MacKenzie Tournament to Save Sharp Park. The highest bid from the online auction will serve as the starting bid at the May 26 in-person silent auction at Sharp Park. The winning bidder will be the highest bid - whether online or in-person - as of the close of the in-person auction on May 26 at 7:00pm PDT. We will be contacting highest online bidders on May 23-24 to confirm your bid with a credit card. Please be sure to include the best email for us to reach you when you sign-up to participate in the auction, and have your credit card handy for pre-authorization over the phone or email. It is important that we communicate with you via phone or email BEFORE 6pm PDT on May 24 to confirm your online bid and obtain your credit card information; otherwise, we may not be able to honor your online bid. The 7th Annual Alister MacKenzie Tournament to Save Sharp Park is hosted by the San Francisco Public Golf Alliance, Sharp Park Men's and Women's golf clubs, Pacifica Historical Society, Pacifica Chamber of Commerce and the Alister MacKenzie Foundation.